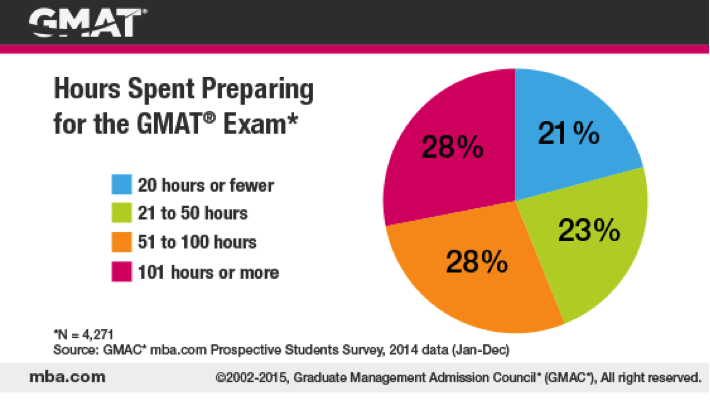 How long should you prepare for the GMAT? When it comes to GMAT preparation, planning is the key. But how much time do you actually need? This is a story about quality over quantity. It’s the question everyone asks: how much time should I set aside to prepare for the GMAT? 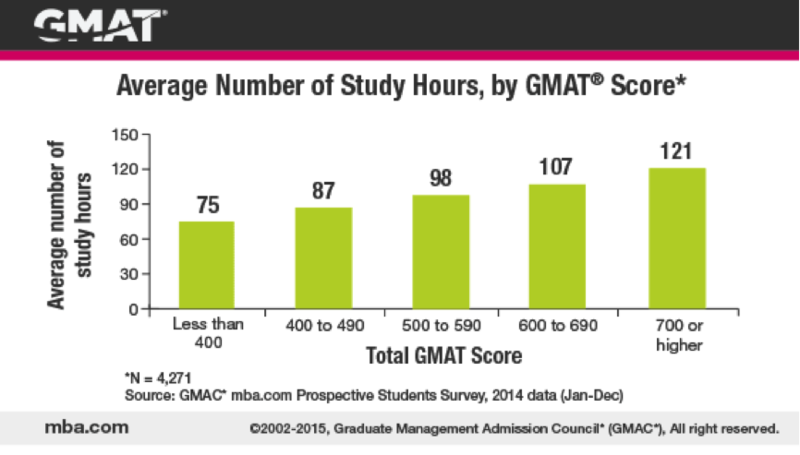 On average, 65% of GMAT test takers spend more than a month studying for the GMAT. 48% of students spend between 4 and 9 weeks preparing for the GMAT. 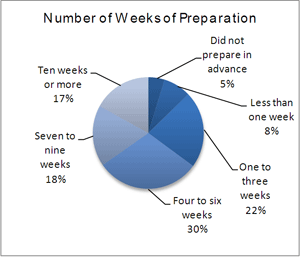 Although it seems as if the GMAC really invested effort into creating this impressive pie chart, the number of weeks you spend preparing for the GMAT doesn’t really help you understand the amount of time required to prepare. Using data collected from nearly 8,000 GMAT test takers, we calculate that 44% of the test takers spend at least 51 hours preparing for the GMAT. As one would expect, those who do better tend to spend more time studying. But, studying over 100 hours does not guarantee that you will score in the 600 range. As in other cases in life, it’s the quality of what you do with your time, not just the quantity. I mean, if you sit in front of a piece of paper or a device and only stare at the question without knowing what to do, that will obviously get you nowhere. Please note: These charts are just a guideline, as the times are self-reported and only estimates. 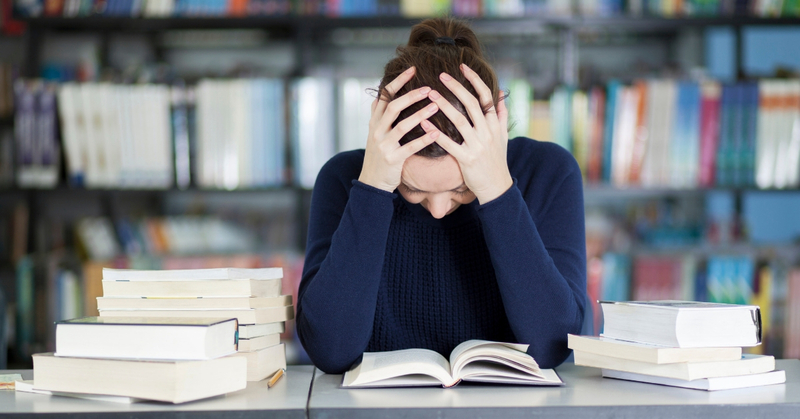 What are some factors to think about when deciding how long to study for the GMAT? How good am I at standardized tests? What’s my level in math and verbal skills? I’ll take a practice test and see how much I actually need to improve. And, on a practical level, how many hours do I have every day to study? If I have a demanding job and a family and few free hours to study every day, it would be better to study for fewer hours over a longer time period (but not over too-long a period). I need to determine how much I should prepare, but make sure that I allow enough time to ensure improvement, so that the results reflect my ability. Familiarize yourself with the exam – What is the test structure? What are the formats of the questions? Focus extra practice time on your areas of weakness – What matters is getting to the correct solution, fast: the problem is that just solving lots of questions (with practice tests or coaching) is not sufficient in terms of improving mental flexibility. Actually, the opposite is true. Solving thousands of questions without improving your mind’s flexibility will only cement the wrong thinking patterns. Train yourself to find YOUR best solution approach to answering GMAT questions – The GMAT measures your ability to flex your mind. That’s why examPAL helps you find your fastest way to solve each GMAT question, making your GMAT preparation process as efficient as possible. 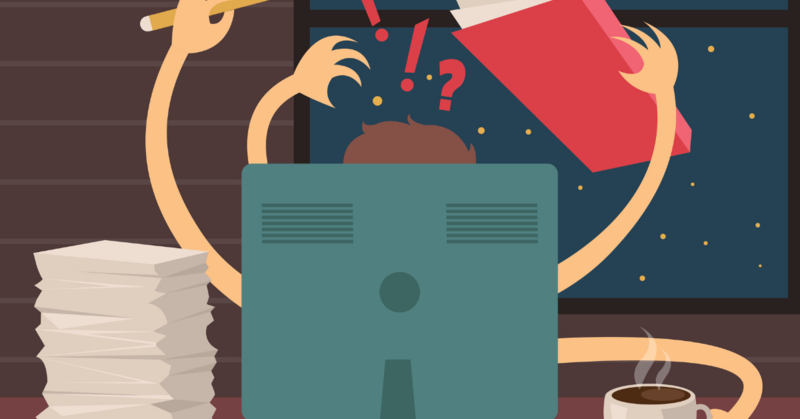 Researching your errors is even more important than solving new questions – Which tools am I using betters than others? What are the main reasons for my mistakes? Which other tools should I learn to apply better? And when it comes to verbal questions, it is also crucial to analyze the answers: why is the correct answer correct? What is wrong with the wrong answers? 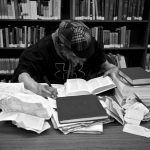 Practice test should be used as tools for improvement, not just to see “where I stand,” which means that you should allow 4 hours of research for every test, and not take two tests in one day, one after another, so as to allow yourself some time to strengthen your weaknesses and prepare for your next opportunity to improve. Get more GMAT preparation tips here. 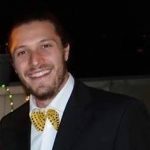 Senior GMAT Tutor at examPAL, is an experienced actuarial analyst who has been tutoring for the past 8 years in subjects including GMAT prep, financial statistics, english, physics, and accounting. How Long Will it Take You to Prep for the GMAT? So, the ideal frame of time for studying is no more than a month or month and half away from the test date. And the more hours you can concentrate on studying, the better. Good to know. I work overnights just 3 nights a week and the rest of the week, my sleep schedule stays the same, so I’m able to avoid any distractions while studying. Thanks for the tips! I’m planning on applying for a MBI (masters in international business), and I’ve noticed that a GMAT is a prerequisite for some of the courses. It’s a lot of money, so I’m trying to decide whether I really need it, when not all courses require it. 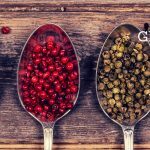 Can you please give me a couple of reasons why I should pick a course that requires a GMAT? I probably won’t have 3 months free time to study for the course until next year, so I’ve got plenty of time to prepare and look at my different options. I know some people take less time to study, but if I’m invested in it and can take the extra time then I think it makes the most sense for me. Thanks for commenting. Usually it’s the program you are trying to apply to requires a GMAT score, not a specific course. I would advise to go back to the website of the program you are interested in and make sure you understand the minimum requirements in order to apply. As for the amount of time you need to study for the GMAT, most people won’t need 3 months is they are using examPAL, and in general our recommendation is to squeeze 100-120 hours in about 8 weeks. A month could be tight if you are a first timer. I recommend taking 6-8 weeks if that’s the case. 3 overnights a week is tough. You might want to consider taking a month off those overnights shifts. I have exactly 32 days left for my GMAT. Iam weak in basics of almost all the Quant and Verbal concepts, but have all the proper materials to study. How much hours would I need to put totally to get a score of 700 +? At this point you have 30 days to prep. That’s very tight, and assuming you already studied for the GMAT before taking the mock tests, reaching 700+ is going to be very tough. If you haven’t started to seriously prepare, and you took these mock tests just to get an understanding of the GMAT, than there’s still a chance. examPAL was created so you will be able crush the GMAT within 4 weeks. It will require you to spend 30 hours per week, 5 hours per day, and 1 day to rest each week. I recommend you also spend an hour each day reading academia-level articles in English in order to improve your reading speed and vocabulary. If you rather prepare alone, I can’t really say how many hours it will require to reach 700+. It’s going to be a very hard task. I’m actually quite surprised by these numbers. When I initially clicked on this article I thought it was going to say around 200 hours would be a good place to start for studying, so this is quite a bit lower than I was expecting. But you’re right, it all comes down to the person and also how effectively you’re using your study time. 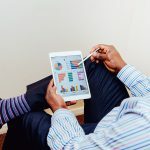 You have some excellent points here on how to wisely use your study time and I think the most important is to actually learn from your practice tests and to focus only on one at a time. I think everything else just falls into place from that.